Last summer, I wrote a story about SpongeBob SquarePants and Patrick taking a trip as a way to introduce ER verbs to my students. I'm not a trained TPRS teacher, but I do like the idea of using a story to teach or reinforce grammar and vocabulary, and after attending some fantastic TPRS workshops over the years, I decided to dip my toes in the TPRS pool. I read this story with my students over two days (they knew what most of the words meant, they just didn't know the rules yet for conjugating verbs), having them copy down in a chart next to each pronoun every verb they saw that went with that pronoun. Each day, after reading the story, I had the students discuss what all the forms had in common for each pronoun. The first half of the story deals with je, tu, il (with one nous form as a preview), and the second half of the story deals with nous, vous, and ils. The students were able to see the patterns and determine the rules without me having to be a "sage on the stage." That being said, no matter how it's introduced, students still need lots of practice before they internalize it. After reading the story and determining the rules, I asked students to look at pictures depicting the story and write a sentence (using their new rules) about what is happening, or fill in a sentence I started. There is certainly no end to activities you can use to exploit a short story, and I only touched the tip of the iceberg. Feel free to use this story to introduce or reinforce ER verbs to your students. I had originally used the name of the city where I teach as the destination, but changed it to New York City for the blog. Consider changing the destination to your school's town to add a slight personal touch. You might even change the characters if there are some that your students find more appealing. Bob est une éponge. Il habite à Bikini Bottom. Il aime voyager. Un jour, il voyage à New York avec son ami Patrick. Il travaille au Krusty Krab de 10h00 à 15h00, et il arrive à l’aéroport à 16h00. Mais où est Patrick ? Le vol est à 17h00 ! Il regarde son mobile. Il y a un message de Patrick ! -Bjr Bob, j'arrive dans 15 minutes. 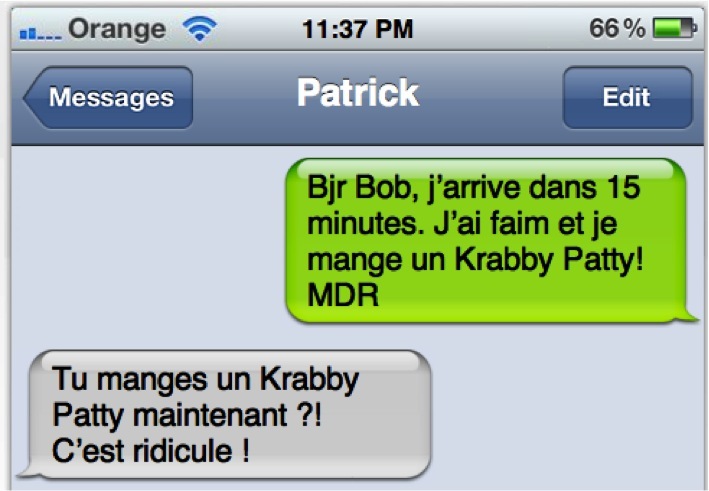 J'ai faim et je mange un Krabby Patty! MDR! -Tu manges un Krabby Patty maintenant ? C'est ridicule ! -Patrick, est-ce que tu manges encore ? Je voyage à New York dans 5 minutes ! Soudain, voilà Patrick ! Il arrive ! -Désolé, Bob, j’aime manger les Krabby Patties ! -Ça va, répond Bob. Nous visitons New York ! Youpi ! À bord de l’avion, Bo est content. Il écoute son iPod. Patrick demande, Est-ce que tu écoutes “Jellyfish Jam” ? L’avion atterrit à New York à 20h00. Bob est très content ! Il parle avec un monsieur à l’aéroport. -Un taxi à New York ? Ça coûte 40$. -Ah non ! J’ai juste 39$ avec moi ! Soudain, voilà Sandy ! Elle arrive ! Quelle coïncidence ! -Bob ! Patrick ! Vous visitez Long Island ? -Non, nous visitons New York, répondent-ils. -Quelle coïncidence ! Moi aussi ! Voyagez avec moi, j’ai une bicyclette pour trois personnes ! Ils arrivent à Manhattan et dînent à un restaurant. Le serveur est fantastique. Il arrive et demande, « Vous désirez ? » Ils mangent trois crêpes ! Le serveur arrive avec la facture. -Vous visitez New York ?, demande-t-il. -Oui, nous arrivons aujourd’hui. Nous habitons à Bikini Bottom. -Est-ce que vous écoutez la musique des Bikini Bottomites ?, demande-t-il. -Mais bien sûr nous écoutons les Bikini Bottomites ! Après une semaine, ils voyagent à l’aéroport à bicyclette. -Nous dînons bien à New York, dit Bob. Drrrrrrrrrrr Hein ? Bob est à la maison, dans son lit. Il regarde son horloge. Il est 6h00 du matin ! -C’est juste un rêve ? C’est dans mon imagination ? Ah zut ! Très créatif! L'idée a tout de suite capter mon attention! Les élèves adorent quand nous sommes créatifs et quand utilisons des personnages qu'ils connaissent! Chapeau! Merci bien! Je essayerai avec mes étudiants au collège.